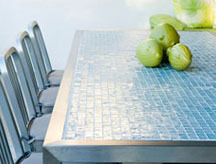 Ashland-e colors 1" x 1"
Eye-catching colors, rustic elegance and recycled glass make Ashland-e an exceptional choice! Due to the handmade character of this tile series, variations in shade, color and size within each sheet should be expected. Additional colors are available by special order. All tile in the Ashland-e series is comprised of between 30 and 70 percent glass from bottles and/or other waste glass that would otherwise have entered the solid waste stream. This waste glass is a mix of approximately 90 percent post-consumer and approximately 10 percent pre-consumer material.